Gordon Brown has insisted that he will carry on as prime minister despite predictions Labour will fare badly in this week's local and European vote. 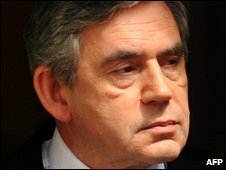 Mr Brown rejected calls to quit, saying he was the man to tackle the recession and the expenses scandal. He told BBC Radio 4's Today he was not "arrogant" or "unwilling to listen" but would "stay on to do the job" before calling a general election. "I'm the best person to clean up the political system," he added. Mr Brown said: "I think the cleaning up of the political system is best done by someone who has got a clear idea of what needs to be done - and I have." Asked if he would step down if it became clear that Labour would do better with someone else leading the party, he said: "I do believe that if people looked at what needs to be done at the moment it is to get us through this economic downturn." He said he would not let "temporary setbacks" deter him from doing what was right for the country. Mr Brown said "major constitutional reform" was needed to restore the public's faith in politics, and promised to form a National Council for Democratic Renewal to help bring about change. He pledged an extension of freedom of information to "open up areas of our public life". "I think we also need to give citizens more rights, so that they can hold people to account and so they feel their interests are better served by the political system," Mr Brown added. He said the allowances of all MPs should be scrutinised and any members who were guilty of wrongdoing would be subject to "due process" before a general election so voters could have all the information they needed to judge their representatives. 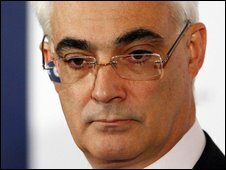 The prime minister also defended Chancellor Alistair Darling over fresh expenses claims in the Daily Telegraph, insisting he did not think there was "substance" to the the paper's reports. Speaking before Mr Darling agreed to repay about £700 claimed for service charges on his second flat for a period in which he was living in Downing Street, Mr Brown added: "If he had done anything wrong he would be the first to admit it." Mr Darling said it was "untrue" he had claimed for two properties at once but would repay the flat's service charges for September to December 2007. Lib Dem leader Nick Clegg has already demanded the chancellor's resignation over his changes in second home designations and claims to cover accountants' fees. "It's simply impossible for him to continue in that role when such very major question marks are being raised about his financial affairs," Mr Clegg said. Mr Brown was speaking after Conservative leader David Cameron repeated calls for an early general election so that voters could be "part of the picture" and get rid of politicians who have been caught up in the scandal. Mr Cameron added: "They want to sit in judgment on MPs, they want to elect a new parliament that will set the new rules, that will elect a new Speaker, that will make a new start."